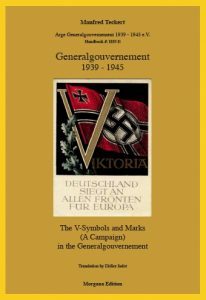 Information in English | Arbeitsgemeinschaft Generalgouvernement 1939 – 1945 e.V. The Arbeitsgemeinschaft Generalgouvernement (1939 – 45) e.V. is linked to the “Bund Deutscher Philatelisten – BDPh” (Association of German Philatelists). The goal of this study group is to support the interest of collectors of the area known as Generalgouvernement. This includes research extending far beyond standard philately. Pictures of NS Symbols are solely used for historic and scientific research purposes and in no way for any propaganda matters. (§86, 86a German Penal Code). The Arbeitsgemeinschaft Generalgouvernement (ArGe GG) was founded in Hannover in 1978 and has over a hundred members spread over all continents. In nearly 35 years 65 revues and 68 handbooks have been published. Several of our members have been awarded high distinctions during national and international exhibitions. The goal of the ArGe GG is the study of the postal history and its inevitable historic links with the German occupation of Poland in the years 1939 to 1945. More than 65 years after the end of WWII, many dark spots concerning postal traffic, still remain. Through close work with other study groups (ArGe), (E.g. ArGe Field-Post, ArGe Poland, ArGe Censored Mail, ArGe Fiscal stamps, ArGe machine cancels, etc), and through corresponding with collectors mainly, also in Poland, we manage to complete more and more the mosaic of the postal history of the General Government. The postal regulations of the Reich Post Ministry (RPM), the official gazettes from the RPM as well as from the Deutsche Post Osten, the field-post and other official regulations, are of course of great help in this endeavour. On the one hand Post-Historians endeavour collecting different franking rates within the different postal rate periods, not only for standard mail, but for field-post, censored mail, official mail, P.O.W. mail, interned personnel mail, camp mail, international mail, and the different forms used by the Deutsche Post Osten. Stamp collectors on the other hand concentrate on the sheet-features and characteristics, the perforation, plate flaws, errors, freaks and oddities. Publications of the ArGe and the benevolent support of experts as Mr Detlef Pfeiffer (BPP) and Mr Michael Schweizer BPP (German Association of Philatelic Experts), have made it possible to track and fight the increasing number of forgeries on the market, and thus avert great damage to collectors. Have any questions about stamps, letters, franking, literature, etc? Do you need information not provided on our homepage? Are you looking to contact an expert to authenticate an item? Would you like to enquire on a postal item? Would you like to sell something but you don’t know where or how? Would you like to join the ArGe GG? Please don’t overlook the fact that we all work on a voluntary capacity and that we have no commercial intents. Nevertheless, as collectors we have been gaining much experience which could be of advantage to you. Just send us an E-mail and we will do our best to answer your request. Here you will find the available literature of the study group. Members of the ArGe GG, Poststempelgilde, ArGe Zensurpost, ArGe Polen, ArGe Ostgebiete und ArGe Feldpost as well as bookstore or book dealers will get a significant reduction on the sales price. For questions and Orders please send an email. One book „Kopernikus“ and Rundbrief arrived today. Many thanks! This is the best club journal I have seen so far. Exclusive quality in full colour and many interesting things to read. Congratulations! I will do some promotion in the end of my article sets for the ArGe and its publications. Or it will be in my bimonthly stampcolumn.